Reading a Patricia Bellomo novel at the beach. Heading to the beach this spring for a little rest and relaxtion? If you’re off to seek the sun and sand, don’t forget to load up your kindle or nook, or better yet, pack several good books: Beach Reads, to be exact. Noting too heavy or dramatic for the beach. It’s not the place to brush up on classics or delve into a literary masterpiece. But nothing beats basking on the beach with a good romantic thriller or a novel of suspense and intrigue. Some of the best beach reads are books that are set in romantic and tropical settings. Nothing like reading about the beach while actually being on one. Of course, exotic settings are good reads for rainy days, too. The key is to immerse yourself in a great escape. 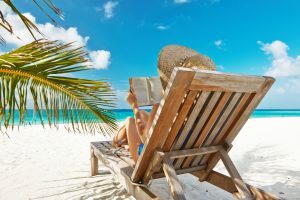 Some of my best beach reads are books by Elin Hilderbrand, Donna Leon, and James Grippando. I also favor John Sandford’s series, books by John Lescroart, and my favorite, John le Carre. Who is your favorite author for beach reading? Added to this list are my own books: Louie Morelli’s Mistress, Stella di Mare, Louie Morelli’s Daughter, and my latest award winner, The Prince of Mafia Princes. Signed copies available on website.